In many accounts of aliens throughout history the constellation of Orion seemed to play a part in their finding earth and their guidance of the earthly beings. 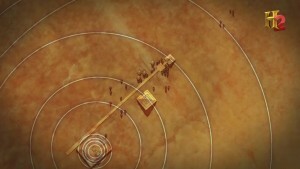 Many people say that the pyramids of Egypt are perfectly aligned with the constellation Orion. This fascination with ancient aliens and this constellation may be due to its prominent position on the celestial equator that makes it visible from the four corners of the earth. The constellation was given its name in reference to the hunter of Greek Mythology by the same name. The brightest of the stars in and around the constellation are Rigel and Betelgeuse which are the Beta and Alpha stars. South of Orion’s belt you will find the Orion Nebula. This constellation is often referenced as being a guiding constellation to aliens that came here many years ago. The biggest reason why Orion may be considered to be so important to the ancient aliens is the fact that you can easily use Orion to locate other constellations. Orion is easy to see from wherever you are in the world and you can use the location of its stars to create a heavenly road map. Maybe we think that because this constellation is so useful to us in providing a landmark that it would have been useful to the ancient aliens in creating maps for them to follow. Orion is made up of four stars that create a rectangular shape. These stars are Rigel, Betelgeuse, Bellatrix and Saiph. Situated in the center of the rectangle formed by these four stars is three smaller stars that create what is known as Orion’s belt. 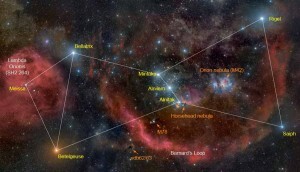 The stars making up Orion’s belt are Alnitak, Alinalm, and Mintaka. From the position of these three stars you will see three smaller stars descending below them. The smaller stars are actually two stars and the Orion Nebula that creates the hunters sword. Many researchers believe that the Orion Nebula acted as a stargate, or entry point that the ancient aliens used to enter our universe. It does seem that many of the civilizations of old were fascinated with this constellation. Many things were constructed in such a manner as to hint that they were being constructed to line up with Orion’s belt and the Orion Nebula. If travelers from other galaxies did come to earth then they might have originated from this strategically placed constellation, or used the constellation as a land mark for their travels back to their home galaxy. It is odd that this is the only constellation that is always visible from every location on earth. It would seem that there is a message being sent by this fact alone. Add to the fact that every civilization has had a story or myth that was created about this alignment of stars in the night sky. Each country has a story about this group of stars and they have special names that it has been given. Is it a coincidence that Orion is something that all nations have in common? Michio Kaku is the man who warned us before about a large solar eruption in 2012 and who is also known for his talent to think outside of the box. Today we want to show you a piece of that. Michio .